Handling dangerous goods requires special expertise to ensure there are no risks to human life during the journey. The mission of our dangerous goods team to work closely with our customers to make overall safety the first priority. All handling procedures are in full compliance with IATA safety standards and requirements and local jurisdictions. Our IATA Dangerous Goods certified staff provides regulated handling at all stations. Special storage areas are available for dangerous goods at our warehouses, and are operated following IATA designated rules and approved by local authorities. 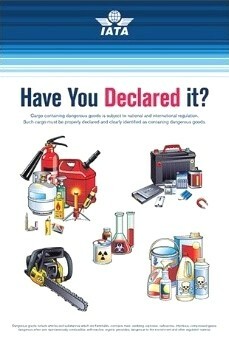 Dangerous goods can only be accepted in accordance with IATA Dangerous Goods Regulations, copies of which are available at your local Strategic Cargo sales office. The outer packaging must show the full shipping name of the contents. The shipper is legally responsible for the declaration, classification, packing, marking, labelling and documentation of all dangerous goods consignments. Strict and severe penalties apply to any person or company who ignores the regulations by misdeclaration of contents, incorrect packaging, inaccurate declarations, etc. If a consolidated consignment or mixed consignment includes dangerous goods, such articles must be tendered separately, and must be clearly indicated as dangerous goods in the Nature and Quantity of goods (including dimensions or volume) box on the AWB. They must also be clearly indicated as dangerous goods on the AWB Extension List (when an Extension List is used). **Freighter Service Only, restrictions apply for other carriers.